← Cars finally supporting Trees! 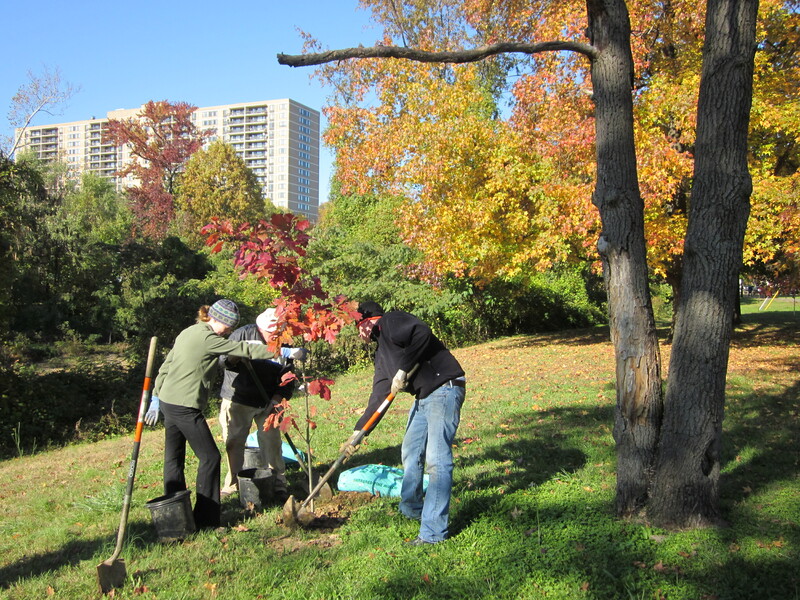 TreeStewards and other volunteers plant a Northern Red Oak. Photo by R.H. Simmons/RPCA. TreeSteward volunteers helped plant a total of 32 native trees characteristic of alluvial floodplain communities and mesic forest along Holmes Run were planted, including 12 Northern Red Oak (Quercus rubra), 6 River Birch (Betula nigra), 4 Bitternut Hickory (Carya cordiformis), 4 Flowering Dogwood (Cornus florida), 3 Hornbeam (Carpinus caroliniana), and 3 Swamp White Oak (Quercus bicolor). In addition, 18 large trees (2.5” cal. and 12-14’ tall) – 6 White Oak (Quercus alba), 6 Scarlet Oak (Quercus coccinea), and 6 Black Gum (Nyssa sylvatica) – were planted by the Horticulture and Natural Resources Section of Recreation, Parks and Cultural Activities at Brookvalley Park (south side), All Veterans Park, and beyond to supplement plantings there. Scarlet Oak, which prefers drier soils, was selected for the knoll at All Veterans Park. in alluvial floodplain communities along Holmes Run are: River Birch, Northern Red Oak, White Oak, Willow Oak, Pin Oak, Swamp White Oak, Bitternut Hickory, Sycamore, Sweetgum, and Green Ash. This planting project and care of trees is a good example of TreeSteward volunteers partnering with Alexandria’s Office of Environmental Quality, Office of City Arborist, and Natural Resources Specialist Rod Simmons. TreeStewards thank you for including us in your efforts to care for our region’s tree canopy. This entry was posted in Advocacy, Community Service, Tree Care and tagged Alexandria, native plants, planting. Bookmark the permalink.